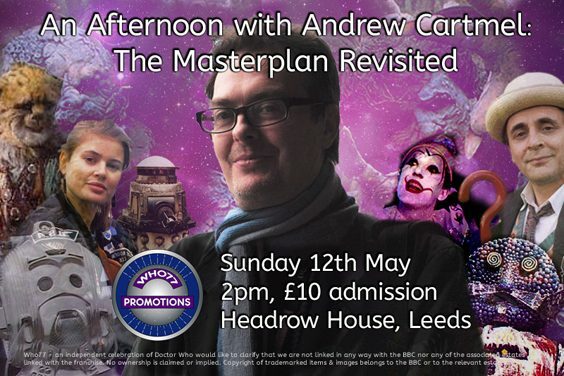 There’s a treat in store for fans of Doctor Who, as Who77 Promotions brings another exciting event to Leeds: ‘An Afternoon with Andrew Cartmel’ takes place on Sunday 12th May. Cartmel was Script Editor for the popular science fiction series in the tumultuous period from 1987 to 1989, when the BBC scrapped the long running show. David Schuster talks to Steve Bartle, of Who77 Promotions. Why is Andrew Cartmel’s time as Dr Who script editor so interesting? Andrew’s story is one of the most fascinating in the history of Doctor Who. He came in as Script Editor after the most turbulent time in the show’s history. The show was openly derided by senior personnel at the BBC for most of the eighties, disparaged as being inferior to its previous glory days of the sixties and seventies. During the Colin Baker era, BBC management made aggressive changes; moving it around the schedules, stripping back budgets and ultimately putting the show on hold for 18 months in 1985. Their true intention was never to bring it back, but the public outcry was completely underestimated, and they were forced to backtrack. Although ratings never fully recovered, Andrew brought respect back to the show, as well as a vast array of wonderful ideas from the team of new writers he discovered. By the time the show was finally axed, until its re-birth in 2005, he had delivered some fantastically adult and complex storylines, and restored the faith of the fans, if not the BBC. How he navigated these stormy waters and managed to change the direction of the show is one of the greatest stories from nearly sixty years of the programme. The cancellation was a complete shock to those working on the show at the time then? Total shock would be an exaggeration, because the BBC were so unsupportive throughout Andrew’s tenure. However, he had set out a template of bringing back the mystery of the Doctor through the much quoted ‘Cartmel Masterplan’. The behind the scenes story of getting Season 24 to air is truly mind blowing. So, we’ll find out what would have happened to the Doctor if the series had continued? Absolutely. Some of the ideas are fantastic, and I can’t wait for Doctor Who fans to hear them, although I fear they will be disappointed that we never got to see them on screen! What will be the format of the afternoon? We’ll primarily look at Andrew’s time on Doctor Who, as there is just so much to cover in the 12 stories he worked on. Brilliant for fans, but also for anyone else interested to learn what goes into bringing ideas to screen. Then we will look at his career in its entirety, from his time on Casualty to turning down Bergerac! We will also discuss his writing career and his hugely successful novels, ‘The Vinyl Detective’ series. We have some brilliant video clips to accompany the talk, and of course there will be our legendary Q&As. And I understand that you’ve got an announcement planned? Yes, I’ll be revealing the guest speaker for the next event! I’m constantly trying to secure new guests. As a Doctor Who obsessive, I run by the logic that if I find them fascinating then hopefully others will. Our first event was such a success I am sticking to that logic! I also don’t want to pick guests that attend every other Doctor Who event, as a lot of our fans will have seen them before. I want our events to be fresh, exciting and memorable.